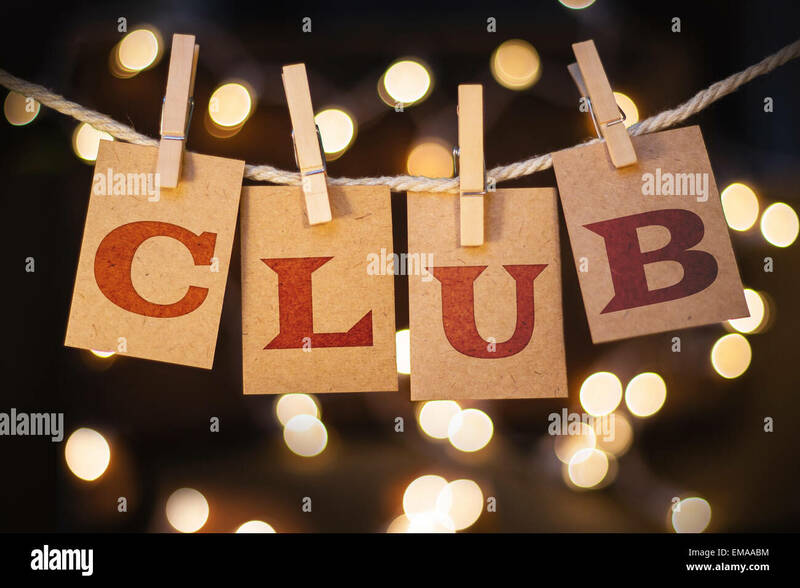 Come and see our new quilting space! 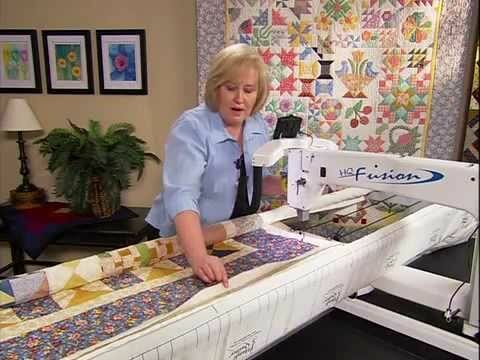 The Sewing Works Quilting corner is a here to help you finish more quilts. You can even mail your quilts to us to finish and we can mail them out to their new homes. Call or stop in for more information 541-798-9111. Please mail quilts to The Sewing Works PO Box 848 Merrill OR 97633. 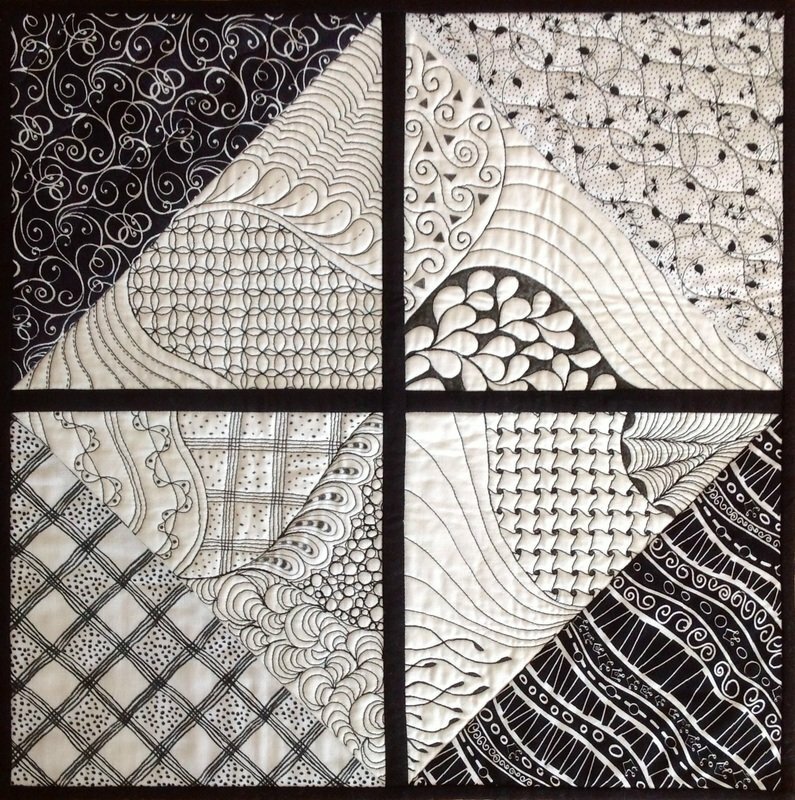 Edge to Edge Quilting Sizes (prices are per square inch) Minimum price $35. Hover over the pictures above to see size and price. Want us to do the binding? No problem. Prices are per linear inch. 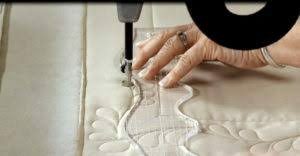 Regular 1 Step Binding: Binding will be prepped and sewn onto the front of the quilt by machine. $0.10 per linear inch. Regular 2 Step Binding: Binding will be prepped, sewn onto the front, and then handsewn to the back of the quilt. $0.20 per linear inch. Double 1 Step Binding:Double binding has one color fabric for the front and another color that shows on he back of the quilt. Binding will be prepped and sewn onto the front of the quilt by machine. $0.14 per linear inch. Double 2 Step Binding: Double binding has one color fabric for the front and another color that shows on he back of the quilt. Binding will be prepped, sewn onto the front of quilt and hand sewn to back. $0.20 per linear inch. Flange Binding: Flange binding is binding of 1 color with an accent fabric color that frames the top of the quilt. It is sewn to back and to the front of the quilt by machine. $0.18 pre linear inch. We offer the batting for your quilt projects, too. We carry Wam & White, Warm & Natural, 70% Polyester 30% Cotton blend, and Wool. Plus there is even more options available just next door from Tater Patch Quilts. Want to quilt your own? We have classes to teach you how and state of the art machines to make it fun and easy. Required prior to renting the longarm machine. We supply backing, batting, fabric and thread for a quilt sandwich (approx 40 inches square). 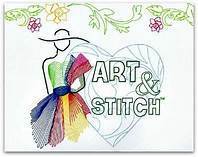 In this 2 hour class you will learn to load the quilt, machine threading and tensions needed to achieve quality stitches. Also learn how to tie off and basic quilting techniques. Use rear handlebars and a paper pantograph to create an all over design. 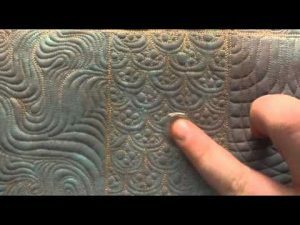 In this 1 hour class you will learn to progress your way quilting edge to edge. Proper advancing and line-up of your pattern and techniques in using a laser light to follow a paper pattern. 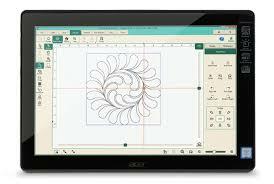 Computerized quilting of an allover design custom fit to your quilt. In this 2 hour class you will learn to use Pro-Stitcher Premium software to load a digitized quilting design, set area, resize and repeat design across your quilt for your desired look. Techniques to use for advancing or thread break will also be covered.